“The 2010-2011 seasonal flu vaccine will include the H1N1 strain that was responsible for the 2009 pandemic,” said Vicki Monks, media spokesperson for the Oklahoma City-County Health Department.
. It is the jurisdiction of the US Department of Agriculture to determine whether plants are environmentally safe; this case is about whether the plants can cross pollinate (by wind, insects, etc) and contaminate other plants. This could have cost Monsanto billions of dollars. Millions of Americans are waking up to the fact that the Federal Reserve is bad, but very few of them can coherently explain why this is true. For decades, an unelected, privately-owned central bank has controlled America’s currency, run our economy and has driven the U.S. government to the brink of bankruptcy. It operates in great secrecy, it has never been subjected to a comprehensive audit and yet the actions it takes have an impact on every single American. It is an institution designed to drain wealth from the U.S. government (and ultimately from the American people) and transfer it to the ultra-wealthy. Have you ever wondered why a sovereign nation such as the United States has to borrow United States dollars from anyone? Have you ever wondered why a sovereign nation such as the United States does not even issue its own currency? Have you ever wondered why we allow a group of unelected private bankers to run our economy? Walmart Putting Radio Tags on Clothes to Track Them? #50) A new report released by the United Nations is publicly calling for the establishment of a world currency and none of the major news networks are even covering it. #49) The state of California is so broke that Arnold Schwarzenegger has ordered California State Controller John Chiang to reduce state worker pay for July to the federal minimum allowed by law — $7.25 an hour for most state workers. #48) A police officer in Oklahoma recently tasered an 86-year-old disabled grandma in her bed and stepped on her oxygen hose until she couldn’t breathe because they considered her to be a “threat”. #47) In early 2009, U.S. net national savings as a percentage of GDP went negative for the first time since 1952, and it has continued its downward trend since then. #46) Corexit 9500 is so incredibly toxic that the UK’s Marine Management Organization has completely banned it, so if there was a major oil spill in the North Sea, BP would not be able to use it. And yet BP has dumped over a million gallons of dispersants such as Corexit 9500 into the Gulf of Mexico. #45) For the first time in U.S. history, more than 40 million Americans are on food stamps, and the U.S. Department of Agriculture projects that number will go up to 43 million Americans in 2011. #44) It has come out that one employee used a Federal Emergency Management Agency credit card to buy $4,318 in “Happy Birthday” gift cards. Two other FEMA officials charged the cost of 360 golf umbrellas ($9,000) to the taxpayers. #43) Researchers at the State University of New York at Buffalo received $389,000 from the U.S. government to pay 100 residents of Buffalo $45 each to record how much malt liquor they drink and how much pot they smoke each day. #42) The average duration of unemployment in the United States has risen to an all-time high. #41) The bottom 40 percent of all income earners in the United States now collectively own less than 1 percent of the nation’s wealth. #40) In the U.S., the average federal worker now earns about twice as much as the average worker in the private sector. #39) Back in 1950 each retiree’s Social Security benefit was paid for by 16 workers. Today, each retiree’s Social Security benefit is paid for by approximately 3.3 workers. By 2025 it is projected that there will be approximately two workers for each retiree. #38) According to a U.S. Treasury Department report to Congress, the U.S. national debt will top $13.6 trillion this year and climb to an estimated $19.6 trillion by 2015. #37) The federal government actually has the gall to ask for online donations that will supposedly go towards paying off the national debt. #36) The Cactus Bug Project at the University Of Florida was allocated $325,394 in economic stimulus funds to study the mating decisions of cactus bugs. #35) A dinner cruise company in Chicago got nearly $1 million in economic stimulus funds to combat terrorism. #34) It is being reported that a 6-year-old girl from Ohio is on the “no fly” list maintained by U.S. Homeland Security. #33) During the first quarter of 2010, the total number of loans that are at least three months past due in the United States increased for the 16th consecutive quarter. #32) According to a new report, Americans spend twice as much as residents of other developed countries on healthcare, but get lower quality and far less efficiency. #31) Some experts are warning that the cost of bailing out Fannie Mae and Freddie Mac could reach as high as $1 trillion. #30) The FDA has announced that the offspring of cloned animals could be in our food supply right now and that there is nothing that they can do about it. #29) In May, sales of new homes in the United States dropped to the lowest level ever recorded. #27) Federal border officials recently said that Mexican drug cartels have not only set up shop on American soil, they are actually maintaining lookout bases in strategic locations in the hills of southern Arizona. #26) The U.S. government has declared some parts of Arizona off limits to U.S. citizens because of the threat of violence from Mexican drug smugglers. #25) According to the credit card repayment calculator, if you owe $6000 on a credit card with a 20 percent interest rate and only pay the minimum payment each time, it will take you 54 years to pay off that credit card. During those 54 years you will pay $26,168 in interest rate charges in addition to the $6000 in principal that you are required to pay back. #24) According to prepared testimony by Goldman Sachs Chief Operating Officer Gary Cohn, Goldman Sachs shorted roughly $615 million of the collateralized debt obligations and residential mortgage-backed securities the firm underwrote since late 2006. #23) The six biggest banks in the United States now possess assets equivalent to 60 percent of America’s gross national product. #22) Four of the biggest U.S. banks (Goldman Sachs, JPMorgan Chase, Bank of America and Citigroup) had a “perfect quarter” with zero days of trading losses during the first quarter of 2010. #21) 1.41 million Americans filed for personal bankruptcy in 2009 – a 32 percent increase over 2008. #20) BP has hired private security contractors to keep the American people away from oil cleanup sites and nobody seems to care. #19) Barack Obama is calling for a “civilian expeditionary force” to be sent to Afghanistan and Iraq to help overburdened military troops build infrastructure. #18) On June 18th, two Christians decided that they would peacefully pass out copies of the gospel of John on a public sidewalk outside a public Arab festival in Dearborn, Michigan and within 3 minutes 8 policemen surrounded them and placed them under arrest. #17) It is being reported that sales of foreclosed homes in Florida made up nearly 40 percent of all home purchases in the first part of this year. #16) During a recent interview with Larry King, former first lady Laura Bush revealed to the world that she is actually in favor of legalized gay marriage and a woman’s “right” to abortion. #15) Scientists at Columbia University are warning that the dose of radiation from the new full body security scanners going into airports all over the United States could be up to 20 times higher than originally estimated. #14) 43 percent of Americans have less than $10,000 saved for retirement. #13) The FDIC’s deposit insurance fund now has negative 20.7 billion dollars in it, which represents a slight improvement from the end of 2009. #12) The judge that BP is pushing for to hear an estimated 200 lawsuits on the Gulf of Mexico oil disaster gets tens of thousands of dollars a year in oil royalties and is paid travel expenses to industry conferences. #11) In recent years the U.S. government has spent $2.6 million tax dollars to study the drinking habits of Chinese prostitutes and $400,000 tax dollars to pay researchers to cruise six bars in Buenos Aires, Argentina to find out why gay men engage in risky sexual behavior when drunk. #10) U.S. officials say that more than three billion dollars in cash (much of it aid money paid for by U.S. taxpayers) has been stolen by corrupt officials in Afghanistan and flown out of Kabul International Airport in recent years. #9) According to a report by the U.S. Department of Transportation’s Bureau of Transportation Statistics, the baggage check fees collected by U.S. airlines shot up 33% in the first quarter of 2010 to $769 million. #8) Three California high school students are fighting for their right to show their American patriotism – even on a Mexican holiday – after they were forced to remove their American flag T-shirts on Cinco de Mayo. #7) Right now, interest on the U.S. national debt and spending on entitlement programs like Social Security and Medicare are somewhere in the neighborhood of 10 to 15 percent of GDP. By 2080, they are projected to eat up approximately 50 percent of GDP. #6) The total of all government, corporate and consumer debt in the United States is now about 360 percent of GDP. #5) A 6-year-old girl was recently handcuffed and sent to a mental facility after throwing temper tantrums at her elementary school. #4) In Florida, students have been arrested by police for things as simple as bringing a plastic butter knife to school, throwing an eraser, and drawing a picture of a gun. #3) School officials in one town in Massachusetts are refusing to allow students to recite the Pledge of Allegiance. #2) According to one new study, approximately 21 percent of children in the United States are living below the poverty line in 2010. #1) Since 1973, more than 50 million babies have been murdered in abortion facilities across the United States. This is data from only one foreclosure auction company – and I can only get data back 15 days – but THIS is interesting. 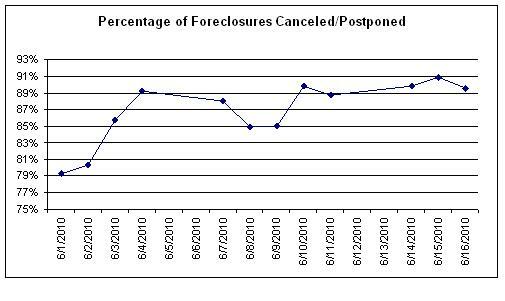 91% of the scheduled foreclosure sales yesterday were either canceled or postponed! The Bureau of Labor Statistics (BLS) today released their Producer Price Index (PPI) report for March 2010 and the latest numbers are shocking. Food prices for the month rose by 2.4%, its sixth consecutive monthly increase and the largest jump in over 26 years. NIA believes that a major breakout in food inflation could be imminent, similar to what is currently being experienced in India. Some of the startling food price increases on a year-over-year basis include, fresh and dry vegetables up 56.1%, fresh fruits and melons up 28.8%, eggs for fresh use up 33.6%, pork up 19.1%, beef and veal up 10.7% and dairy products up 9.7%. On October 30th, 2009, NIA predicted that inflation would appear next in food and agriculture, but we never anticipated that it would spiral so far out of control this quickly. The PPI foreshadows price increases that will later occur in the retail sector. With U-6 unemployment rising last month to 16.9%, many retailers are currently reluctant to pass along rising prices to consumers, but they will soon be forced to do so if they want to avoid reporting huge losses to shareholders. Food stamp usage in the U.S. has now increased for 14 consecutive months. There are now 39.4 million Americans on food stamps, up 22.4% from one year ago. The U.S. government is now paying out more to Americans inbenefits than it collects in taxes. As food inflation continues to surge, our country will soon have no choice but to cut back on food stamps and other entitlement programs. LONDON — As interest rates on Greek debt spiral upward again, the question facing Europe is no longer whether Athens has the political will to cut spending and raise taxes to curb its gaping budget deficit, but whether Greece will run out of money before it gets the chance to do so. Interactive Map Debt Rising in Europe.With the rate on 10-year Greek bonds reaching as high as 7.5 percent on Thursday, up from 6.5 just three days ago, the cost of insuring against a Greek default hit a record high. The message from the market could not be clearer: artfully worded communiqués from Brussels will no longer suffice. To avoid bankruptcy, analysts said, Greece needs a bailout from Europe, and fast. “This is no longer about liquidity; it’s a solvency issue,” said Stephen Jen, a former economist at the International Monetary Fund who is now a strategist at BlueGold Capital Management in London. But with European officials consumed with a debate over whether loans to Greece should be offered at rates consistent with a typical I.M.F. bailout or punitive ones closer to current market levels, the risk is that while Brussels fiddles, Greece is burning. The statement helped bring yields on 10-year Greek government bonds down from their peak for the day, to 7.35 percent, but it was not enough to turn around the mood of pessimism that contributed to a further fall in Greek and other European stocks. To a large extent, this latest bout of Euro-stasis is a function of Germany’s view that it is not the market contagion from the Greek drama that presents the greatest risk to Europe. Instead, Berlin is far more worried, as Mr. Jen puts it, about the supposed “contagion of bad behavior” in other countries like Portugal and Spain that might follow if Greece were to become the beneficiary of a bailout on relatively generous terms. There are unmistakable signs that individuals and corporations are withdrawing funds from Greek banks, although the sums involved do not yet constitute a bank run. In effect, government pensions for everyone, not unlike the European system and regardless of personal choice. The SEIU, which was integral to the election of Barack Obama as president, is working with the left-leaning Economic Policy Institute (EPI), and the National Committee to Preserve Social Security and Medicare, on SEIU's plan, called "the Retirement USA Initiative." “The failure is broad and deep. It's not just a few people falling through the cracks: most of us already are in the ravine. Three in 10 have only a 401(k) or similar savings plan, and the rest of us are totally out of luck," said Eisenbrey. Eisenbrey said that the median 401(k) account balance was $25,000 in 2006, and the median for workers near retirement was $40,000. "Half of those who had a 401(k) were nearing retirement with less than $40,000 in their account," said Eisenbrey, who is trained as a lawyer and was a Clinton administration appointee from 1999 through 2001. "The financial crisis and the economic recession have shone a spotlight on the inadequacies of today's system," said Stephen Albrecht, director of benefits for SEIU. With the uncertainty in today's global economy, creating a whole new federal entitlement for American workers may not be easy to accomplish for these groups or their allies on Capitol Hill and in the Obama administration, as America's creditors are already getting nervous. Chinese Premier Wen Jinbao is telling U.S. policymakers that he is concerned about the "safety" of his country's already huge holdings of U.S. debt. "We have lent a huge amount of money to the United States," said Wen, according to a report in the Financial Times. "We are concerned about the safety of our assets. To be honest, I am a little worried. I request the U.S. to maintain its good credit, to honor its promises and to guarantee the safety of China's assets." The government is looking at ways to promote the conversion of 401(k)s and IRAs into steady payment streams after a significant decline in plan balances (Bloomberg) — The Obama administration is weighing how the government can encourage workers to turn their savings into guaranteed income streams following a collapse in retiree accounts when the stock market plunged. Promoting annuities may benefit companies that provide them through employers, including ING Groep NV (INGA:NA) and Prudential Financial Inc. (PRU), or sell them directly to individuals, such as American International Group Inc. (AIG), the insurer that has received $182.3 billion in government aid. A little–noticed law could soon result in smaller Social Security checks for hundreds of thousands of the elderly and disabled who owe the U.S. money from defaulted loans and other debts more than a decade old. Social Security benefits are off–limits to creditors, such as credit–card companies and banks. But the U.S. can collect debts to federal agencies by “offsetting,” or withholding Social Security and disability payments. The Treasury currently withholds benefits of 3.1 million Social Security recipients to recover defaulted student–, farm– and small–business loans, unpaid income taxes, amounts veterans owe for health care, and other debts to the government. Keep an eye on our retirement money folks! March 8 (Bloomberg) — The Federal Deposit Insurance Corp. is trying to encourage public retirement funds that control more than $2 trillion to buy all or part of failed lenders, taking a more direct role in propping up the banking system, said people briefed on the matter. Gas Might Go up to $7 a gallon? To meet the Obama administration’s targets for cutting greenhouse gas emissions, some researchers say, Americans may have to experience a sobering reality: gas at $7 a gallon. Read more at the link……. 7 Days Notice Required to Withdraw Cash from Checking Accounts? This news is disturbing – even if they say the don’t intend to enforce it, the fact that it is ‘required’ by federal law and not unique to Citibank seriously concerns me. I certainly won’t be keeping any of my money in the bank – from now on it is ‘cash on the barrel’. The image of banks locking their doors to keep customers from making withdrawals during a bank run is what immediately came to mind when we heard that Citigroup was telling customers it has the right to prevent any withdrawals from checking accounts for seven days. said on statements received by customers all over the country. What’s going on? It seems that this is something of an error. The seven day notice policy only applies to customers in Texas, Ira Stoll reports at The Future of Capitalism. It was accidentally included on customer statements nationwide.